Having received her Engineering degree on May 29, Annie Wen is flying pretty high. But she’s soaring even higher than your typical McGill graduate – about 10,000 feet higher – because she is one-third of the Montreal Flyers, a team of three young women pilots from McGill who will take part in the Air Race Classic (ARC) from June 16 – 19. The Montreal Flyers (from left to right); Emily Fowler, Annie Wen and Sonya Vinderskov get a little air time in front of their Piper Arrow. 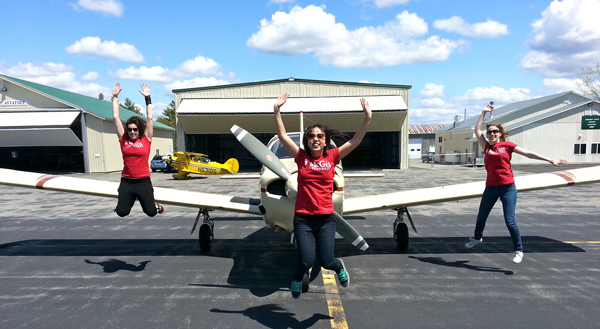 ARC is an annual international women’s air rally covering over 2,400 miles in four days. This year, the coast-to-coast route begins in Concord, California, and ends in New Cumberland, Pennsylvania. And if the whole endeavour brings to mind famed aviator Amelia Earhart, it’s with good reason. In 1929, Earhart and 19 other intrepid female pilots literally launched the beginning of women’s air racing when they competed in the Women’s Air Derby, flying from Santa Monica, California, to Cleveland, Ohio. The Montreal Flyers – comprised of Wen, Emily Fowler and Sonya Vinderskov – will compete against more than 50 teams during the four-day derby and will pilot a 200-horsepower Piper Arrow. Each member of the team will take turns piloting the airplane, navigating, and taking care of radio communications. As a McGill entry, the Flyers are the only Canadian university in the competition. The race is open to all women with fixed-wing aircraft from 145 to 570 horsepower, with each plane assigned a handicap speed. The goal is to have the actual ground speed be as far over the handicap speed as possible. The pilots are thus given the leeway to play the elements, holding out for better weather, winds, etc. The objective is to fly the “perfect” cross-country. In this type of race, the official standings cannot be released until the final entrant has crossed the finish line because the last arrival can be the winner. And while passengers flying commercially often complain about baggage restrictions, Fowler says packing the plane properly is a vital component to this type of flying. “The lighter you are, the better it is, for sure,” she says. “But a lot of it depends on the centre of gravity, and where you place weight in the plane,” noting that you never load heavy objects in the tail because “if you lose an engine,” the plane will tip upward when, ideally, the plane should be pointing forward. And how serious a problem is it if one should “lose an engine?” “As long as you have your wings, your chances of survival are good,” says Fowler, nonchalantly, pointing out that her training as a glider pilot would come in handy in such a situation because, among other things, “I don’t get freaked out by the sound of silence in a plane. Find out more on the Montreal Flyers’ Facebook page.